"Infused with real ruby powder for perfect radiance in a range of classic colors. The Ruby has represented royalty for centuries, and with the infused ruby powder, this lipstick finds the perfect balance between radiance and shine." Giordani Gold Ruby Lipstick is available in 15 colors. 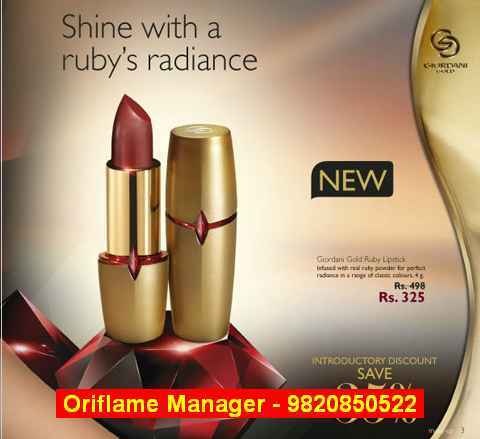 to buy Oriflame Products from me. Mrs. Jashmi is an Oriflame Manager. She is also an Oriflame Certified Beauty Expert. She has been recognized several times for her work at Oriflame events in Mumbai, Pune, Hyderabad, etc.